Nein, das ist leider kein Aprilscherz. 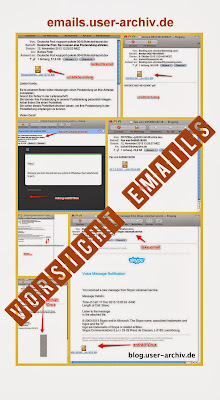 Offenbar schon vor ein paar Tagen hat die Picasa-Desktop-Software aufgehört, Bilder hochzuladen und Alben anzulegen. Ein wichtiges Element im Workflow vieler Fotografen und Blogger ist damit weggefallen. If you want to upload photos and videos to Google Photos, you can use Backup and Sync at photos.google.com/apps. Please note, you’ll still be able to access all of your uploaded photos and videos in Google Photos at https://photos.google.com/. Natürlich kann man mit google-Photos auch Bilder hochladen, aber wenn (wie meist) die Bilder bearbeitet wurden und/oder beim Upload ein Bilderstempel hinzugefügt werden soll, oder nur eine Auswahl hochgeladen werden soll, funktioniert das natürlich nicht. Der User müsste dann erst mal die (ausgewählten und bearbeiteten) Bilder exportieren (dabei einen eventuellen Stempel einfügen) und erst dann den dabei entstandenen Ordner hochladen. Options 6 & 7 will disappear (including direct syncing to the web). If you have the good habit to edit your pictures before uploading via the large green button, you best can export the selected series in full size (and including full video's if present) and then use the UPLOAD-button on https://photos.google.com and then select the exported series. Then you will get the opportunity to create a new album on Google Photos. If you want to add to an existing album, just open that album on https://photos.google.com/albums and then use the UPLOAD-button. After uploading you better can delete the exportfolder to prevent confusion. Before starting, check your setting on https://photos.google.com/settings for High Quality (free storage). 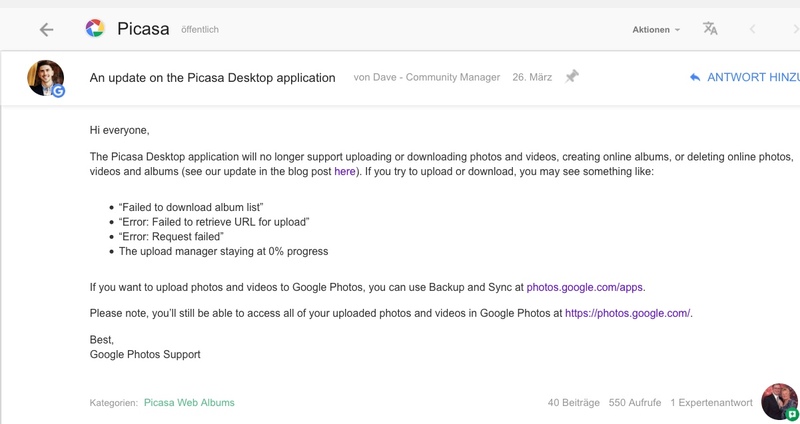 PS: check if you have the latest version of Picasa and store the install file for the future. PS: when you already have many albums on Google Photos, never start to use automatic Backup & Sync because some Community Manager says so.